Sheila Taormina’s Swim Speed Series is America’s favorite guide to faster swimming. 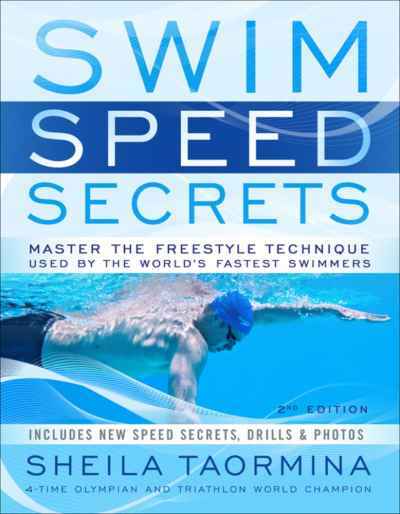 In this new edition of the best-selling Swim Speed Secrets, the 4-time Olympian, gold medalist, and triathlon world champion reveals the swim technique used by the world’s fastest swimmers.Taormina’s guidance is clear and easily understood so any swimmer or triathlete can learn and master the fastest way to swim. Over the course of four Olympic Games and throughout her career as a world champion triathlete, Taormina refined her winning technique through a close study of the sport, examining the world’s best swimmers using underwater photographs, video analysis, and historical archives. From Johnny Weissmuller to Michael Phelps, Taormina found that the world’s fastest swimmers share two common elements: high stroke rate and a high-elbow underwater pull. Though she stands just 5’ 2” tall, Taormina honed her swimming technique to victory and shares her Swim Speed method in Swim Speed Secrets. Many swimmers and triathletes neglect the underwater pull, distracted by low stroke count or perfecting less critical details like body position, streamlining, and roll. Swim Speed Secrets,2nd Ed.focuses on the most crucial element of swimming—producing power—to help swimmers and triathletes overhaul their swim stroke and find the speed that’s been eluding them. With a commonsense approach that comes from decades of intense practice and hands-on coaching experience, Taormina shows swimmers how to transition to faster swimming.